Skin rejuvenation and fat loss constitute a significant part of plastic surgery's aesthetic operations. While facelifts for facial rejuvenation, blepharoplasty operations, liposuction, and contour restoration are performed using plastic surgery techniques, nonsurgical patients and nonsurgical physicians and aestheticians focus on noninvasive and minimally invasive methods. Noninvasive and minimally invasive (in some societies, so-called medical aesthetics) methods have reached an ever-growing economic dimension with increasing demand due to the introduction of various devices and products to the market. Manufacturers, marketers, users, and practitioners who want to increase their share in the aesthetic market sometimes claim that the results are comparable to the surgical operations. However, it is not possible to obtain a result that is comparable to surgeries. There are a couple of exceptions; one of them is Botox practice. It is frequently used for the rejuvenation of the upper face and, nowadays, has greatly reduced the requirement of aesthetic surgery operations including the lifting up of forehead and brow, even though the results are temporary. However, there is no other minimally invasive or noninvasive method other than Botox, reaching the satisfactory results as the surgical outcomes. Radiofrequency (RF) is an important method among ablative, noninvasive, and minimally invasive methods used for rejuvenation, regional fat loss, and contour restoration. Because it can be applied to all kinds of skin types, RF has been adopted from the beginning and gained popularity in this field. With the widespread use of RF, various RF devices have emerged; different application techniques are being defined and continue to be developed. RF technology includes any electromagnetic wave frequencies within the range of 3 KHz to 300 MHz. An RF field is composed of both electrical and magnetic components. The frequency range of RF devices used in skin rejuvenation ranges from approximately 0.5–40 MHz. The frequency of RF device is important, and it is inversely proportional to the depth of penetration. It is known that the lower frequencies have higher penetration rates. For instance, the penetration depth of 40 MHz frequency will remain superficial compared to that of a frequency of 1 MHz. The tissues have a resistance against electrical currents (impedance) and this resistance creates heat; therefore, the RF penetration depth is calculated by tissue impedance and RF frequency. Energy (J) = I2 × R × T (I: Current, R: Impedance, t: Time/seconds).,,, As can be seen with formula, the heat that will emerge is directly related to the power of the electrical current and the tissue resistance. As a result, the same result in different areas and different individuals with the same RF current cannot be obtained. Different tissues will have different resistances, and similar tissues will have different resistances in different individuals. Therefore, either of the target temperature should be monitored, or the practitioner must have enough experience to achieve adequate heating. The electrical conductivity of each tissue is different. Electrical conductivity is elevated in regions with high blood circulation. The bone has a poor electrical conductivity. Thickness of the dermal layer in patients may also vary at different anatomical sites (2–5 mm). Likewise, skin properties, such as having cellulites, require deeper heating of the subcutaneous layers. Conversely, other conditions, such as rhytids, require reduced heating of the dermis layer. High-impedance tissues, such as subcutaneous fat, generate greater heat and account for the deeper thermal effects of RF devices., The heat generated by the RF will depend on the resistance of the tissue to the electrical current. Therefore, in different tissues, heat will form at different degrees and different depths. For this reason, it is more likely to obtain nonreliable results. Therefore, the procedure must be done on the same tissue by the same person. The RF stream is transmitted to tissue by a header. Noninvasive heads can be monopolar (with grounding used, heads without grounding are called unipolar heads), bipolar, multipolar, and fractional. Minimal invasive headers include fractional (with microneedle heads insulated or noninsulated) and subcutaneous probes. The monopolar head is usually used in conjunction with a grounding located in the right arm, and in practice, the current is directed from the monopolar head to the ground that turns the tissue resistance to heat in order to obtain the deepest effect. In this way, the depth control can also be estimated. Bipolar, tripolar, or multipolar heads have + and − poles on the same head. For this reason, no grounding is required. The current flows between two poles of the head and the depth at which the current reaches is assumed to be half of distance between two electrodes., However, it should be noted that the depth will also vary with different frequencies. When the RF energy is transferred from the monopolar head as electromagnetic radiation rather than as a current, the obtained dielectric heating is rather resistive heating, so no grounding is required, and it is called unipolar RF. Fractional minimally invasive RF devices may be divided as bipolar or multipolar and electrode fractional RF or microneedle fractional RF. In fractional RF, multiple electrode arrays (pins) or paired microneedles are used for heating the tissue. There are some untreated areas left to help accelerating wound healing and maintaining skin integrity., Different histologic patterns of fractional injury may be produced by using noninsulated or insulated needles. While the use of noninsulated needle creates fractionalize damage to the epidermis, insulated needles only heat an area of the sphere at the tip of the needle, protecting the epidermis and the dermoepidermal junction. In RF applications, combining variables (frequency, current duration, tissue resistance, head type, noninvasive usage, etc.,) with other technologies have resulted in a broad variety of different RF devices. 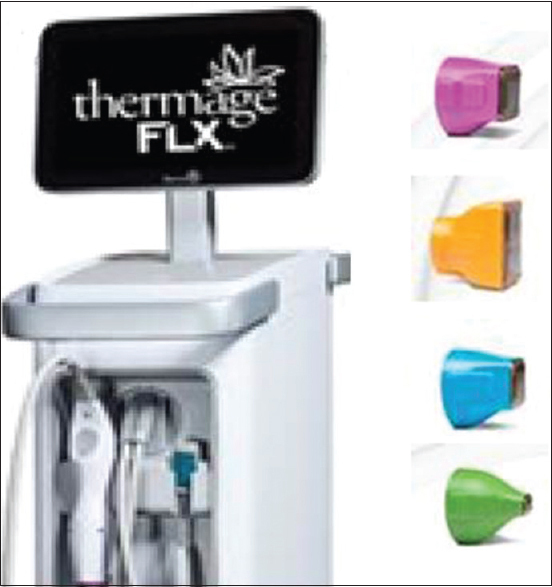 Thermage/Thermacool is the first RF device for the treatment of wrinkles and has a frequency of about 6 Mhz. Thermage/Thermacool warms deep tissues with a monopolar head under computer control. The Thermage CPT system (Solta Medical, Hayward, California, USA) is a vibration setting incorporated with a handpiece of monopolar RF [Figure 1]. The system has a digitally pulsed cryogen spray unit which enables precooling, parallel cooling, and postcooling of the epidermis. The monopolar RF Trusculpt (Cutera) has its own large electrode RF current reaching to 7–15-mm deep and providing heat for fat apoptosis, thus aiming for fat reduction. 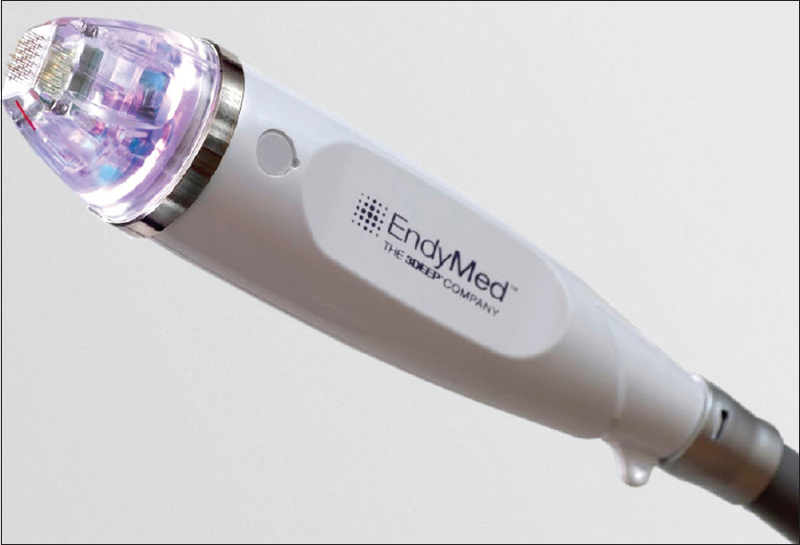 EndyMed Intensif applicator (EndyMed Ltd., Caesarea, Israel) uses an array of 25 noninsulated gold-plated microneedle electrodes with a maximum penetration depth of 3.5 mm., Exilis system (BTL Aesthetics, Prague, Czech Republic) and Pelleve (Ellman International, Inc., Oceanside, NY, USA) use a continuous motion technique to deliver RF energy to the skin [Figure 2]. Today, there are various devices that the frequencies can be adjusted. VR52 (VCA laser, Beijing, China) uses 1–40 MHz adjustable RF energy with monopolar, bipolar, and tripolar face (small) and body (large) heads [Figure 3]. 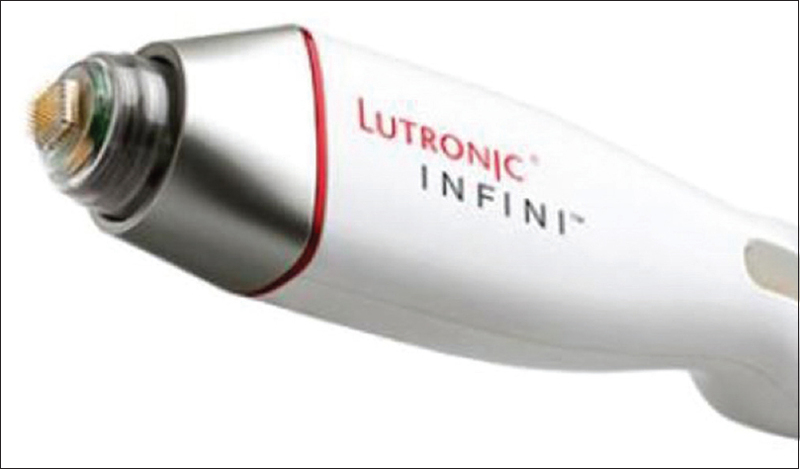 INFINITM (Lutronic Corp., Goyang, South Korea), is a High Intensity Focused RF system which has 1 MHz RF, with bipolar array of insulated microneedles (7x7/1 cm2) that are embodied in a single-use disposable tip [Figure 4]. Because the shaft of the needle is insulated, there is no electrothermal damage to the epidermis and the dermoepidermal junction. Therefore, epidermal cooling is not needed. Manufacturers name the technologies and even the applications heads as TM. For example, Tune Face™ is a cooled, vacuum-assisted unipolar, 40.68-MHZ, 6-pin, fractional RF applicator, used for the face. Similar to the heads, also, some devices are found on the market in the market with popular names that summarize the method. Examples include channeling optimized RF energy (CORE); electrooptical synergy (ELOS);, switching, vacuum, and cooling (SVC); and functional aspiration controlled electrothermal stimulation (FACES). The practitioner should examine these types of technologies and know what they mean. While special names can sometimes emphasize a significant technological difference, they sometimes aim to increase commercial popularity. Using RF devices, skin wrinkles and various skin conditions can be treated, including periorbital rhytids, lower cheek jowl, nasolabial folds, marionette lines, lower lid tightening, brow lifting, atrophic scaring, acne and acne scarring, cheek laxity, neck rejuvenation, and axillary hyperhidrosis. Over time, RF usage areas are expanding. Fistonić et al. used monopolar focused noninvasive 3.25-MHz RF device for labia tissue tightening. Key and Boudreaux and Biesman and Pope used RF on eyelid rejuvenation (by protecting eye with a plastic ocular shield)., Pongsrihadulchai et al. used nanofractional RF device for striae alba. For posterior upper arm skin laxity, a subdermal thermistor-controlled monopolar RF was used. Ideally, the patient group will consist of individuals with mild, moderate laxity, mild lines, and wrinkles between 35 and 60 years of age. For severe laxity and deep wrinkles, invasive surgical methods, such as face/neck lifting, should be considered. Anticipation of the patient is important, and it is necessary not to apply RF to the patient who can get successful results only by invasive surgeries. RF produces heat deep in the dermis due to tissue electrical resistance. With RF application, different levels and different degrees of heat are produced under the skin. The heat increases collagen denaturation that results in shrinkage and the desired rejuvenation effect. The RF effect is achieved by heating the fibroblasts to such an extent that they stimulate the production of collagen and allow the collagen and elastic fibers to shrink. As a result, the skin becomes thicker, firmer, and more tense. In RF applications, the temperature of the same tissue varies depending on the depth of the tissue, the frequency, the power of the devices, the types of the head, the maximum temperature reached, the heat exposure time, and tissue hydration as well as tissue type and age. Collagen is composed of triple helix of proteins connected by interchain hydrogen bonds. When collagen is heated with RF, the bonds are affected, triple helix degrades, collagen part is denatured and contracted. The tissue is burnt as a result of overheating. Ideal shrinkage temperatures range from 57°C to 61°C, but the time of the heat applied is important as well. The effect of mechanical stress on fibroblasts stimulates extracellular matrix remodeling, which occurs after the contraction phase of wound healing. It has been shown that mechanical stretching causes an increase in Type I and Type III collagen expression, demonstrating that mechanical stress alone can also act on collagen and skin without heat effects. Fibrous septa: Heating deeper tissue disrupts fibrous septa, and the result is three-dimensional tissue contracture. With the shrinkage and contracture of the fibrous septa between the subdermal fat tissues, there is not only a tightening in the horizontal plane of the skin but also a shortening in the vertical plane (Z-dimension). Capillary blood flow and adipocytes: RF heating increases local capillary blood flow which increases adipocyte metabolism. Moreover, nonthermal effects of RF include adipocyte stimulation, leading to lipase-mediated degradation of triglycerides or even adipocyte apoptosis. The heating effect increases microcirculation, homogenizes subdermal fat, and increases skin elasticity. Thermal exposure at 43°C for 10 min results in a delayed adipocyte cellular death,, and thermal exposure at 45°C for 3 min results in a loss of cell viability in 60% of adipocytes.In vivo fat cell lipolysis is enhanced by increased delivery of catecholamine hormones, which is improved by enhancement of blood flow. Fibrous septa contract to inward as deeper effect of RF. RF stimulates neocollagenesis, elastin, and ground substance production, which results in delayed dermal tightening and contour changes. Immediate posttreatment biopsies after RF do not give much evidence. However, perivascular and perifollicular infiltrates can be seen after a few weeks, and a similar amount of shortening and shrinkage in collagen fibers is shown in electron microscopic evaluation. The RF current, like SIRT6, upregulates Sirtuin genes while downregulating SIRT1, 3, 5, and 7, resulting in new collagen formation and increased fibroblast survival. An electromagnetic field from which the RF current is generated has thermal and nonthermal effects. For the thermal effect, almost everyone agrees that there is a collagen contraction and shrinkage of collagen as well as the stimulation of collagen synthesis. Nonthermal biologic effects occur in cell membrane receptors and channels, which induce cytoprotective growth factor synthesis, heat shock genes, synthesis of mucopolysaccharide and elastic fibers (improve firmness and elasticity of skin), increase enzyme activity, transcription of specific genes, mRNA expression. As the skin tensioning and tightening effect takes place at a depth of about 5 mm, monopolar and low frequencies may be required when an effect of vertical effect in fibrous septa and fatty tissue is desired. RF heats dermis,,,,,,,,,,,,, up to a point to obtain therapeutic effect without damaging the surrounding tissues. It is important to keep the temperature below 45°C for epidermal (surface) heat treatment of the skin when aiming 3–6-mm deep dermis heat at around 65°C in the RF applications. Fibroblasts are thought to be stimulated for the production of collagen when heated at 55°C–65°C. Subdermal probe measurements showed that collagen remodeling at 42°C–46°C, septal tightening at 55°C–65°C, lipolysis, liposculpting at 65°C–70°C, and nerve damage at 85°C can be obtained. Elman et al. suggested that skin temperatures must reach 50°C, for skin collagen formation and cell proliferation. However, for skin tightening and lifting effects, the dermis should be heated up to 40°C–50°C. Sufficient heating in the tissues depends on electrical current, duration, and tissue resistance. Tissue resistance differs significantly between the patient and the treatment area. Lack et al. pointed out that the highest level of impedance occurs at arms, then the forehead, cheeks, and back. Although minimally invasive RF devices are considered to be more effective and controlled in heating dermis without damaging the surrounding area, aesthetic patients are easier to adapt to noninvasive methods and their demands toward this are increasing. The use of RF emphasizes the importance of heating the dermis up to 65°C–75°C in the literature, while the temperature of the epidermis should not exceed 42°C–45°C. It is not possible to measure the temperature of the dermis noninvasively, although it is possible to measure the temperature in the epidermis with IR cameras. Minimally invasive RF devices are important for this reason. Their aim is to heat the desired point to create a heat at the exact target point. Minimally invasive devices that measure temperature in both superficial and subdermal tissues were developed, and such devices can directly measure the temperature of the application area with a thermistor located at the tip of the internal probe, while epidermal temperatures are measured directly with an IR camera system. 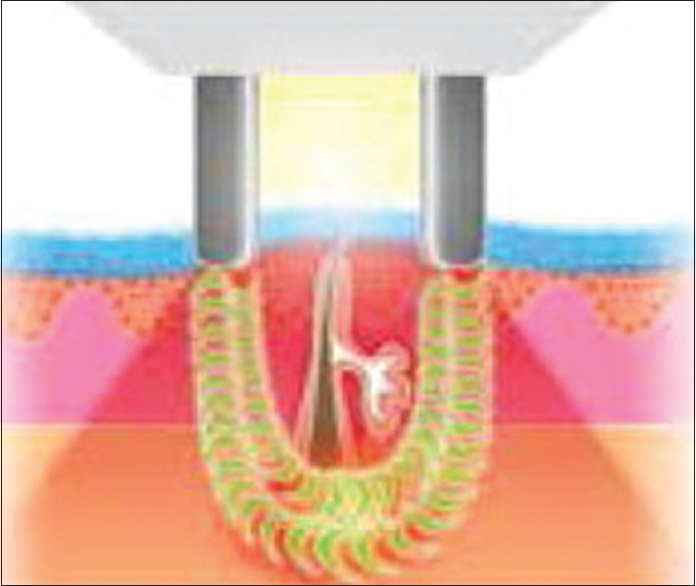 This type of dual system provides temperature-controlled dermal and subdermal tissue therapeutic thresholds necessary for collagen remodeling. Dermis needs to be heated to achieve a clinical effect with RF, although there are different opinions about how much heat will be generated in the dermis. 55°C–65°C is considered to be sufficient for the clinical effect. It is not possible to measure the heat formed in the dermis, except using an invasive RF with a subdermal probe during in vivo application for experimental investigations. Sufficient results cannot be obtained with suboptimal heat. For this reason, the patient's response to exposure to heat, the observation of changes in the skin, and the experience of the doctor are important. RF application results have been evaluated histopathologically in many in vivo and ex vivo studies. In addition to the immediate effects achieved by RF, there are fibroblast, adipocyte stimulation, and increased capillary circulation and delayed effects. Hence, homogenization of histopathological changes is difficult and changes occur after hours, days, and weeks in the tissues following an application. In Belenky's study, the subcutaneous tissue sample was discontinued due to a microtrauma that happened 8 h following RF on pork skin, and the new connective tissue formation showed that healing process was visible. Alvarez et al.showed histopathological changes including partial detachment of the stratum corneum, follicular dilation, arrangement of melanin pigment in irregular clusters, irregular areas of epidermal hyperplasia, congestion and dilation of the dermal blood vessels, dermal edema, and increased dermal thickness in series of biopsies after RF application. Immediate heating results in collagen denaturation with a resultant fibrous contraction and tissue thickening determined by transmission electron microscopy studies. Clinical observation and patient feedback are more widely used in assessing RF outcomes, rather than limited histopathological changes. Pritzker et al. draw attention to the inadequacies between the techniques used in skin rejuvenation, and even the comparative evaluation of technologies, as well as the differences in assessment standards and subjectivity. Radiologic and ultrasonic measurements of tissue thickness and histopathological findings support the effectiveness of RF, but it is not possible to evaluate the RF results objectively. Subjective assessments are based on the visual interpretation of doctors, observers, and participants. Different Classification Systems such as the Fitzpatrick Wrinkle classification, the Lael laxity classification system, and the Alexiades laxity scale,, are used in this assessment because the results are hard to standardize. Measurements are made to the standard with the help of some devices; the physical measuring device (BTC-2000, SRLI Technologies, Nashville, TN, USA) measures both elasticity and skin stiffness. Likewise, Wakade et al. used ultrabiomicroscopic sonography to measure decrease in subepidermal low-echogenic band of the nasolabial folds after RF and glycolic acid peeling treatments. It is aimed to heat the target with RF application, the target is often dermis and collagen at the region and the treatment area may also contain fibrous septa, fat tissue, and nerves in the subcutaneous tissue. The epidermis needs to be protected during dermal heating. Keeping the epidermal heating at 39°C–42°C temperature range will be enough to protect the tissue. How we provide this with the RF device depends on the different devices and their characteristics. On some devices, RF is applied to a field with a single touch, while in some devices the RF header is circulated at the area. If the device does not have a thermal meter to monitor the dermal heat, the effect is determined by the patient's skin, and the reaction of the patient against the heat. In practice, it is useful to have a thermal camera in hand; now, thermal cameras are very small and can be adapted to tablets and mobile phones. During application, it may be necessary to change the power of the RF current, while more current is required in regions where the skin is thicker, and less current is required in regions where the current is thinner. It is possible with gel application to protect the epidermis during RF application and allow the head of the device to slide easily in the treatment area. If the device does not have its own cooling system, using a gel will be sufficient. Cold air can also be applied for epidermal cooling. No significant preparation is required before RF application, but skin cleansing is necessary. Dirt, oil, and makeup materials that may affect the passage of electrical current must be removed. The application process is generally done from top to bottom (“Free-hand”) sweeping (“paint-brush”) motion, with horizontal strokes and vertical strokes alternating until the set time expires. Because RF is not a light-based treatment, eye protection is not necessary unless applied directly to the eyelids. It is recommended to have wet gauze placement between teeth and lip when working on the lips. When we apply RF to the eyelid, we need a plastic protector for the device and eyes. When Key et al. applied RF for 6 min using a 10-mm cap on the eyelids with ThermiSmooth (Thermi, Irving, Tex. ), they used a plastic eye shield for eye protection. Skin tightening, edema development, pain, and erythema during application should be closely followed up to reduce the risk of complications and obtain. Dover et al. suggested that for optimal energy selection, patient pain feeling feedback is a valid method, and treating to a clinical endpoint of visible tightening with multiple passes at moderate energy settings provides substantial and consistent results. Application can be performed in varying numbers depending on device, treatment area, and frequency and electrical current used. High energy with fewer pass or low energy with multiple passes can be applied.,, The low energy with multiple passes will seem relatively safe, but it will be exhausting and will require a longer time. It may not be homogeneous to reach therapeutic degree with heat accumulation. With a high-energy low pass, it is possible to achieve a shorter treatment time and more homogenous therapeutic doses with increased risk. Epidermal cooling and moniterization of epidermal heating is important when high energy with fewer pass is used. The duration of the application is important for the patient and the physician. Patients consider it as a lunch break application and they want to complete the treatment as soon as possible. As for physician's perspective, time is very valuable, therefore shortening treatment time by using high-dose single-pass setting will be preferred, but we must remember applying high energy is risky. RF treatments are popularized with the slogan of maximal results with minimal side effects,, Therefore multipass with lower energy option should be considered because collagen denaturation with such settings can also be achieved effectively and safely. In this case, faster and/or wider treatment headings will be required. Patients do not experience downtime unless there is a complication after RF application. The patient immediately feels heat in the skin after treatment, a feeling that lasts for 1–2 h, and almost every patient may have a few hours of erythema and edema. After the process is completed, the use of cooling gel, ice pads, and cold air might help. Sometimes, corticosteroid creams (only once just after RF for erythema) can be supplemented with sunscreens. It is recommended to use skin moisturizing creams afterward. The heating that occurs during RF applications will naturally be sensed by individuals. As the temperature rises, a feeling of pain develops. Pain threshold varies significantly from patient to patient, and some patients barely tolerate pain. Pain is described as a brief burning sensation that rapidly dissipates. The difference between the impedance of individuals shows different pain complaint during the same energy and frequency treatments. Therefore, pain sensation is an important indicator and determines the boundary between the effect and the burn for the practitioner. For this reason, some practitioners do not use topical creams that reduce pain. Reducing the sensation of pain will lead to higher levels of heat, but it is important to remember that the outcome and the complication limit are close to each other, and that we do not alter the pain treatment area. The erythema that occurs during the application will help the temperature of the skin surface to be measured by a thermal imager or simply with an IR/laser thermometer to achieve a degree of protection and therapeutic temperature. RF application can often be done only by cooling, but sometimes topical anaesthetic creams or block local anesthesia or sedation may be used. Infiltrative anesthesia is not preferred, as edema may affect the depth of treatment. Kushikata et al. showed that topical anesthesia did not reduce the pain in RF application sufficiently, so that it could not be applied at higher energy levels with topical anaesthetic use, but topical anesthesia did not change RF activity at 3 months of follow-up. The devices measure the heat of the skin surface and can have receivers to determine if the target temperature has reached. However, the heat on the surface may not be correlated with the heat at the deeper tissue. As the frequency of the RF device decreases, the depth of heat increases. It is possible to externally control the surface temperature using coupling fluid, gel, cold air, or peltier. RF application can be done in one session or in many sessions. The number of sessions and time may vary depending on the device and protocols implemented by the clinicians. Multiple-use protocols vary from 4 to 8 sessions and intervals vary from 1 week to 1 month.,,,,,, Therefore, at first, users apply the device with the protocol recommended in the manual, but modify these protocols depending on the results they have received over time. As can be seen in the literature, we can say that there is no standard by looking at the diversity of protocols, because of the differences in the characteristics of the devices, racial differences (directly related to RF skin resistance), and the level of education of practitioners. Among minor complications in the early period include abrasion, edema, erythema, blistering, blanching, bruising, crusting, oozing, and purpura, and they emerged as early clinical manifestations, rather than complications. They are often handled without causing problems. We may place scabbing and ulcers among some more serious early complications; other serious complications include atrophy, hyperpigmentation, scarring, textural change, white area, tenderness, and Poison Ivy). In some cases RF treatment is absolutely or relatively contraindicated, and in some cases it is not recommended., At the same time, we need to pay attention to the case of anatomical structures. Contraindications of RF; pregnancy, electronic implants (pacemaker, heart pill e.g.,) cardiac insufficiency, active or recent malignancy, on metal-containing apparatus such as hip prosthesis, fracture fixation, a history of recurrent herpes simplex (needs preventive antiviral therapy), immune suppression, active local or systemic infections, dermatologic and vascular disorders, increased photosensitivity, collagen-vascular disease, heat-excitable disease, hypertrophic scars, coagulation disorders, wound healing disorders. Relative contraindications of RF; diabetes, oral retinoid use within the last 6 months, topical retinoid use in the last 2 weeks, topical steroid use within the last 2 months, oral steroid use within the last 12 months, RF therapy within the last year, atrophic states of the skin (e.g., chronic radiation dermatitis), patients unrealistic expectations, chronic corticosteroids or chronic nonsteroidal anti-inflammatory medication usage, obese patients, patients with fluctuating weight, excessive skin laxity and excess, poor skin quality (severe photodamage, severe elastosis), poor general or mental health, therapy with dermabrasion, chemical peeling or laser skin resurfacing within the last year, therapy with microdermabrasion within the last 3 months, fat augmentation within the last 18 months, over tattoo or synthetic fillers (silicone). It is safe to use it in patients who have previously undergone facelift, blepharoplasty, laser surgery Botox, or fillers. RF treatment does not cause facial hair loss; therefore, male patients can be treated with no fear to beard or mustache loss. England noted that there was no significant negative interaction between RF and various soft-tissue fillers (collagen, hyaluronic acid, calcium hydroxylapatite, polylactic acid, and injectable liquid) and RF in a filler study using an animal model. Alam et al. reported that there was no significant negative interaction between soft-tissue fillers (hyaluronic acid and calcium hydroxylapatite) and RF in a short term. Along with improvements in technology, the diversity of RF devices is increasing, and new devices are introduced having additional features. Our aim in RF applications is that the patient and the doctor find the results satisfactory without any harm to the patient. This end result will expand the market share with extra features (such as ease of use, quick application, short operation time, the ability to use different frequencies and headings simultaneously, instantaneous temperature changes, and combined technologies). The technological advancement is necessary to improve our knowledge and experience, but encountering new devices do not mean that we will give up using effective devices that currently we have. Noninvasive applications in RF remain important. The main purpose of using noninvasive RF devices is to heat the dermis and fat tissue noninvasively. For effective use of the devices and technology, a physician should evaluate the outcome and the risk interactions, and he should understand the device, the skin and their relationship. 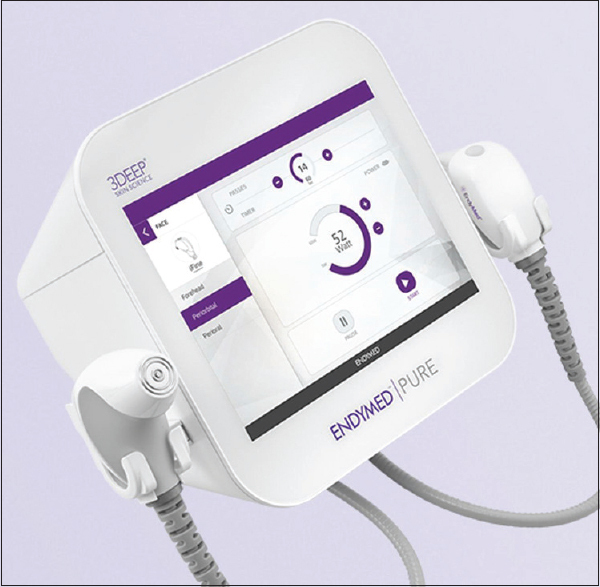 While RF devices seem easy to use, it is necessary to heat the skin sufficient enough without creating epidermal burns, as the experience of the physician increases, it can be used at the high end limit of the device to make the procedure as effective as possible. Inexperienced users will have to choose a more controlled device. The development of the device will ensure that this heating is done specifically at the desired level without damaging the epidermis. Such devices will remove the learning curve and increase safety. Noninvasive methods cannot provide the same results as of invasive or minimally invasive methods. However, they are preferred by patients as noninvasive, lunch time procedures, with no downtime and less complications. Araújo et al. claimed that, in Brazil, in many RF devices, the power is fixed and that it is not possible to obtain the results of international devices that use power at varying degrees. It is not easy to standardize studies related to RF. The variables are too much and it is difficult to control. The number of new assertive devices are increasing, but in practice the end point of devices and treatment results are determined by doctors and patients during application. It is considered that in the studies done, RF applications are effective for varying degrees in patient evaluations, such as face-to-face repetitions, independent evaluation by photographers, Fitzpatrick wrinkle scale, measurement of changes in forehead height, and biopsies taken when subjective evaluation standards are used. The use of inadequate devices or presence of inexperienced, uninformed practitioners leads to doubt for this method, which is considered to be effective in practice. Because the frequency of the end device, the power, and the tissue of the patient will affect the impedance, it is necessary for the doctor to know and analyze them to find the appropriate option. It will be determined by the experience of the user how many sessions will be continued or only single session will be used. The RF should allow the dermis to heat up to around 65°C, while the skin should remain at 40°C–42°C. However, how many minutes should the dermis remain at 65°C. Is it enough to go out of 65°C for only 1 s? For collagen denaturation, both the heat level and exposure time are important. It is shown that 10% of the collagen fibers shrink after heating at 65°C for 10 minutes and 60% shrinkage can be obtained after heating at 80°C for 1.5 minutes. When using microneedle (insulated or noninsulated) in minimally invasive RF applications, we clearly know at what level we apply the RF current to the skin. In this minimally invasive method, the recovery is faster because of the fractional-based procedure, and when applied as a microneedle, the skin also has a dermaroller-like effect. The insulated needles create fractional heat damage in the dermis (usually 300 μ deep) only when needle puncture trauma occurs without any heat effect on the epidermis and epidermodermal compartment. While using noninsulated needles, heat injury also forms in the epidermis and epidermodermal compartments. Controlled damage caused by the application of the insulated needle can be simulated by the damage generated by high-focus ultrasonic (HIFU). Compared to light-based systems, RF applications have the advantage of being more deeply affected, especially when there is less risk of hyperpigmentation. However, regeneration with fractional ablative laser epidermis provides effects such as correction of texture. Gold et al. using EndyMed Intensive applicator (EndyMed, Caessarea, Israel) (an array of 25 noninsulated gold-plated microneedle electrodes) found that 3 months of follow-up is more improvement than 1 month of follow-up in Fitzpatrick's wrinkle and elastosis scale and hypothesized that noninsulated RF needles (emit RF through the whole length of the needle) are more effective than insulated needles (emit RF only through the tip of the needle). We do not have a single device and system to ensure that everything is perfectly implemented, easy-to-apply, and to obtain very impressive results without any complications. We are also faced with many devices that offer different uses of the same system. It is not easy to make the right choice in this complexity since it is not always possible to obtain sufficient and effective results with a single device. Therefore, expensive investments are inevitable for those working in the aesthetic sector. In plastic surgery field, this is a little more difficult, as the surgeon knows that he/she can get much better results with operations, and it is not easy to believe that the result will be achieved with this trait or to be satisfied with about 20%. For this reason, the use of dermatology seems to be more prevalent in the use and operation of such devices. Devices used in skin rejuvenation alone are not adequate to solve the problem, for example, HIFU and RF cannot rejuvenate epidermis, while light-based devices cannot be used with the same efficiency in each skin type. The use of technologies together sometimes increases the efficiency and sometimes can also bring risks together. RF devices are constantly and rapidly changing, and it is difficult for manufacturers to find the same device 2–3 years later. In literature reviews, we will not find a published device on a website of a consumer firm frequently, but we will encounter devices with more advanced and different names. RF devices heat the tissues at different depths depending on their properties. To obtain the effect, the heat to be generated must be at levels that provide collagen denaturation. The user's knowledge and the level of experience are as important as the device to be used to achieve satisfactory results. The user should be familiar with the characteristics of the device and know the properties of the human tissue and the RF physics. Thermal cameras and IR/laser thermometers will also help. It is possible to achieve an effective result with RF, but patient and physician expectations should be realistic. RF applications are safe if attention is paid to contraindications and the limits are not exceeded in practice. The complications that occur are minor and transient. It is safer and more effective to apply using low-energy multipass instead of high energy in practice. It is not possible to achieve a result with RF that is comparable to the surgical operations. Fitzpatrick R, Geronemus R, Goldberg D, Kaminer M, Kilmer S, Ruiz-Esparza J, et al. Multicenter study of noninvasive radiofrequency for periorbital tissue tightening. Lasers Surg Med 2003;33:232-42. Alster TS, Tanzi E. Improvement of neck and cheek laxity with a nonablative radiofrequency device: A lifting experience. Dermatol Surg 2004;30:503-7. Lack EB, Rachel JD, D'Andrea L, Corres J. Relationship of energy settings and impedance in different anatomic areas using a radiofrequency device. Dermatol Surg 2005;31:1668-70. Bogle MA, Ubelhoer N, Weiss RA, Mayoral F, Kaminer MS. Evaluation of the multiple pass, low fluence algorithm for radiofrequency tightening of the lower face. Lasers Surg Med 2007;39:210-7. Biesman BS, Pope K. Monopolar radiofrequency treatment of the eyelids: A safety evaluation. Dermatol Surg 2007;33:794-801. Alster TS, Lupton JR. Nonablative cutaneous remodeling using radiofrequency devices. Clin Dermatol 2007;25:487-91. Lolis MS, Goldberg DJ. Radiofrequency in cosmetic dermatology: A review. Dermatol Surg 2012;38:1765-76. Polder KD, Bruce S. Radiofrequency: Thermage. Facial Plast Surg Clin North Am 2011;19:347-59. Levy AS, Grant RT, Rothaus KO. 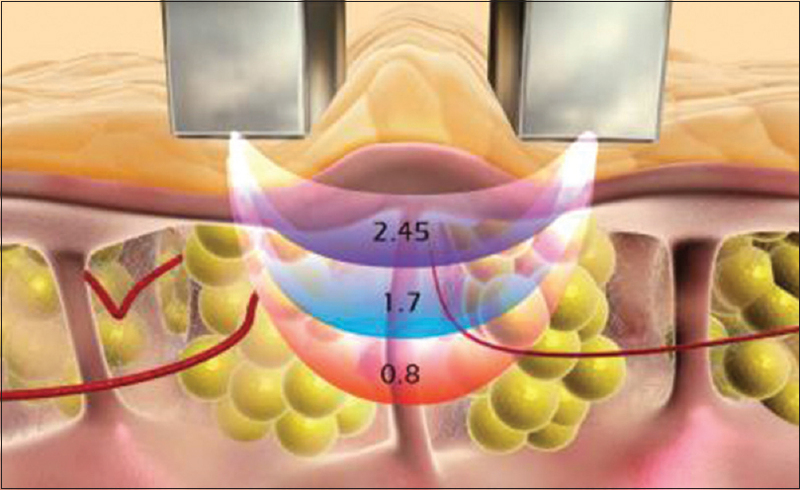 Radiofrequency physics for minimally invasive aesthetic surgery. Clin Plast Surg 2016;43:551-6. Elsaie ML. Cutaneous remodeling and photorejuvenation using radiofrequency devices. Indian J Dermatol 2009;54:201-5. Elsaie ML, Choudhary S, Leiva A, Nouri K. Nonablative radiofrequency for skin rejuvenation. Dermatol Surg 2010;36:577-89. Belenky I, Margulis A, Elman M, Bar-Yosef U, Paun SD. Exploring channeling optimized radiofrequency energy: A review of radiofrequency history and applications in esthetic fields. Adv Ther 2012;29:249-66. Araújo AR, Soares VP, Silva FS, Moreira Tda S. Radiofrequency for the treatment of skin laxity: Mith or truth. An Bras Dermatol 2015;90:707-21. Boisnic S, Divaris M, Branchet MC, Nelson AA. Split-face histological and biochemical evaluation of tightening efficacy using temperature – And impedance-controlled continuous non-invasive radiofrequency energy. J Cosmet Laser Ther 2017;19:128-32. Suh DH, Byun EJ, Lee SJ, Song KY, Kim HS. Clinical efficacy and safety evaluation of a novel fractional unipolar radiofrequency device on facial tightening: A preliminary report. J Cosmet Dermatol 2017;16:199-204. Sadick N, Rothaus KO. Minimally invasive radiofrequency devices. Clin Plast Surg 2016;43:567-75. DiBernardo BE, DiBernardo G, Pozner JN. 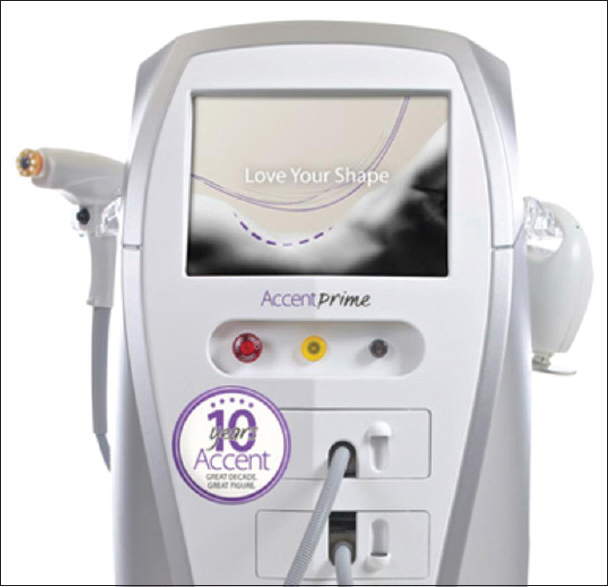 Subsurface laser and radiofrequency for face and body rejuvenation. Clin Plast Surg 2016;43:527-33. Wu DC, Liolios A, Mahoney L, Guiha I, Goldman MP. Subdermal radiofrequency for skin tightening of the posterior upper arms. Dermatol Surg 2016;42:1089-93. Carruthers J, Fabi S, Weiss R. Monopolar radiofrequency for skin tightening: Our experience and a review of the literature. Dermatol Surg 2014;40 Suppl 12:S168-73. Gold M, Taylor M, Rothaus K, Tanaka Y. Non-insulated smooth motion, micro-needles RF fractional treatment for wrinkle reduction and lifting of the lower face: International study. Lasers Surg Med 2016;48:727-33. Tanaka Y. Long-term nasal and peri-oral tightening by a single fractional noninsulated microneedle radiofrequency treatment. J Clin Aesthet Dermatol 2017;10:45-51. Clementoni MT, Munavalli GS. Fractional high intensity focused radiofrequency in the treatment of mild to moderate laxity of the lower face and neck: A pilot study. Lasers Surg Med 2016;48:461-70. Greene RM, Green JB. Skin tightening technologies. Facial Plast Surg 2014;30:62-7. Sadick NS. Combination radiofrequency and light energies: Electro-optical synergy technology in esthetic medicine. Dermatol Surg 2005;31:1211-7. Paasch U, Bodendorf MO, Grunewald S, Simon JC. Skin rejuvenation by radiofrequency therapy: Methods, effects and risks. J Dtsch Dermatol Ges 2009;7:196-203. Elman M, Gauthier N, Belenky I. New vision in fractional radiofrequency technology with switching, vacuum and cooling. J Cosmet Laser Ther 2015;17:60-4. Sadick NS, Nassar AH, Dorizas AS, Alexiades-Armenakas M. Bipolar and multipolar radiofrequency. Dermatol Surg 2014;40 Suppl 12:S174-9. Friedman DJ, Gilead LT. The use of hybrid radiofrequency device for the treatment of rhytides and lax skin. Dermatol Surg 2007;33:543-51. Nicoletti G, Cornaglia AI, Faga A, Scevola S. The biological effects of quadripolar radiofrequency sequential application: A human experimental study. Photomed Laser Surg 2014;32:561-73. Pritzker RN, Hamilton HK, Dover JS. Comparison of different technologies for noninvasive skin tightening. J Cosmet Dermatol 2014;13:315-23. Harth Y. Painless, safe, and efficacious noninvasive skin tightening, body contouring, and cellulite reduction using multisource 3DEEP radiofrequency. J Cosmet Dermatol 2015;14:70-5. Kaplan H, Kaplan L. Combination of microneedle radiofrequency (RF), fractional RF skin resurfacing and multi-source non-ablative skin tightening for minimal-downtime, full-face skin rejuvenation. J Cosmet Laser Ther 2016;18:438-41. Boisnic S, Branchet MC, Birnstiel O, Beilin G. Clinical and histopathological study of the TriPollar home-use device for body treatments. Eur J Dermatol 2010;20:367-72. Gold MH, Biron J, Levi L, Sensing W. Safety, efficacy, and usage compliance of home-use device utilizing RF and light energies for treating periorbital wrinkles. J Cosmet Dermatol 2017;16:95-102. Nobile V, Michelotti A, Cestone E. A home-based eyebrows lifting effect using a novel device that emits electrostatic pulses containing RF energy, resulting in high frequency, low level transdermal microcurrent pulsations: Double blind, randomized clinical study of efficacy and safety. J Cosmet Laser Ther 2016;18:234-8. Kaminaka C, Furukawa F, Yamamoto Y. 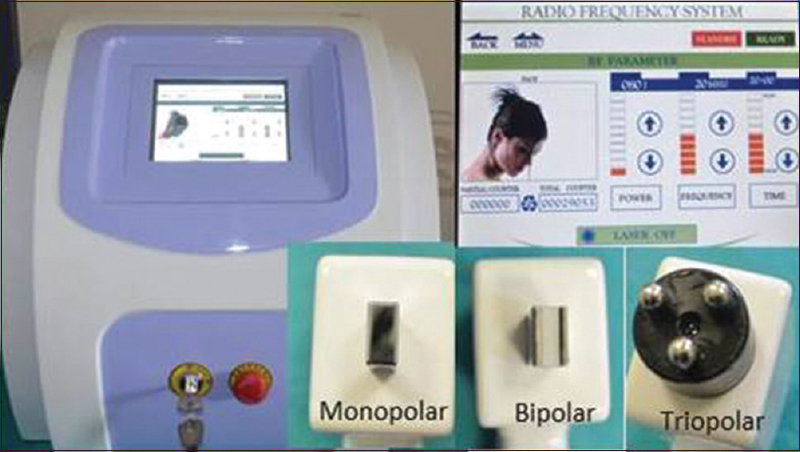 Long-term clinical and histological effects of a bipolar fractional radiofrequency system in the treatment of facial atrophic acne scars and acne vulgaris in Japanese patients: A series of eight cases. Photomed Laser Surg 2016;34:657-60. Fistonić I, Sorta Bilajac Turina I, Fistonić N, Marton I. Short time efficacy and safety of focused monopolar radiofrequency device for labial laxity improvement-noninvasive labia tissue tightening. A prospective cohort study. Lasers Surg Med 2016;48:254-9. Key DJ, Boudreaux L. A proposed method for upper eyelid and infrabrow tightening using a transcutaneous temperature controlled radiofrequency device with opaque plastic eye shields. J Drugs Dermatol 2016;15:1302-5. Pongsrihadulchai N, Chalermchai T, Ophaswongse S, Pongsawat S, Udompataikul M. An efficacy and safety of nanofractional radiofrequency for the treatment of striae alba. J Cosmet Dermatol 2017;16:84-90. England LJ, Tan MH, Shumaker PR, Egbert BM, Pittelko K, Orentreich D, et al. Effects of monopolar radiofrequency treatment over soft-tissue fillers in an animal model. Lasers Surg Med 2005;37:356-65. Kushikata N, Negishi K, Tezuka Y, Takeuchi K, Wakamatsu S. Is topical anesthesia useful in noninvasive skin tightening using radiofrequency? Dermatol Surg 2005;31:526-33. Alam M, Levy R, Pajvani U, Ramierez JA, Guitart J, Veen H, et al. Safety of radiofrequency treatment over human skin previously injected with medium-term injectable soft-tissue augmentation materials: A controlled pilot trial. Lasers Surg Med 2006;38:205-10. Erratum in: Lasers Surg Med 2007;39:468. Dover JS, Zelickson B; 14-Physician Multispecialty Consensus Panel. Results of a survey of 5,700 patient monopolar radiofrequency facial skin tightening treatments: Assessment of a low-energy multiple-pass technique leading to a clinical end point algorithm. Dermatol Surg 2007;33:900-7. Alvarez N, Ortiz L, Vicente V, Alcaraz M, Sánchez-Pedreño P. The effects of radiofrequency on skin: Experimental study. Lasers Surg Med 2008;40:76-82. Zelickson BD, Kist D, Bernstein E, Brown DB, Ksenzenko S, Burns J, et al. Histological and ultrastructural evaluation of the effects of a radiofrequency-based nonablative dermal remodeling device: A pilot study. Arch Dermatol 2004;140:204-9. Wakade DV, Nayak CS, Bhatt KD. A study comparing the efficacy of monopolar radiofrequency and glycolic acid peels in facial rejuvenation of aging skin using histopathology and ultrabiomicroscopic sonography (UBM) – An evidence based study. Acta Medica (Hradec Kralove) 2016;59:14-7.
el-Domyati M, el-Ammawi TS, Medhat W, Moawad O, Brennan D, Mahoney MG, et al. Radiofrequency facial rejuvenation: Evidence-based effect. J Am Acad Dermatol 2011;64:524-35.